The Plott Hound is a large, vocal and energetic breed of dog which makes a fantastic companion, family member, or a tenacious and effective guard dog. The Plott Hound originates from the United States, were originally bred in the mid 18th century as a scent hound and large game hunter. The Plott Hound was originally bred by a German fellow named Jonathan Plott, who sought a dog breed capable of hunting large game such as bear, elk, and other large mammals. Jonathan Plott bred the German Hanoverian Schweisshunden with bloodhounds and various dog breeds. The Plott Hound is a powerful, energetic breed which loves its pack. The Plott Hound can be protective, making socialization and training all the more important, but also makes it a fantastic watchdog. The Plott Hound is very loud and talkative and can present as quite intimidating. However, the Plott Hound is a gentle giant at heart and can all be loving and careful when interacting with their loved ones. The Plott Hound is an incredibly loyal companion. The Plott Hound is a great dog and will fit in nicely with almost all families, however buying a dog is always a big financial decision and cannot be made lightly. Financially, emotionally and otherwise, finding a new dog can be stressful and overwhelming. This guide is designed to mitigate this stress and make the process as easy as possible, refer to these steps if you feel overwhelmed, the Plott Hound could be the perfect dog for you and your home. What Price are Plott Hound Puppies? The Plott Hound is not an expensive dog, typically selling for between $300 and $500 USD. Be cautious of any prices lower than this, as there is likely something shifty going on. Finding a breeder with good ethics is essential. Where to Find Reputable Plott Hound Breeders? The first step of your journey in getting a new dog is to find a good breeder. It can be stressful and overwhelming but in reality, finding a good breeder is one of the easiest ways you can set your future friend up for their best tilt at life, giving them a healthy and happy headstart with a great breeder makes all the difference. A good breeder will carry themselves with a sense of professionalism. They will respect your decision-making process, not pressuring you or try to persuade you of anything. They will hear your concerns and give informative, helpful answers. This is a big financial and personal decision and if they are true professionals, they will respect that. All great dog breeders are dog fanatics. They should be true animal lovers and will likely hold a wealth of information about the breed. Ideally, the breeder should be happy to tell you everything you want to know about the breed, how to care for them and their behaviors etc. Feel free to ask any questions you have, if they are a good breeder they will be excited to answer them. Very importantly, the breeding facilities should be well cleaned, spacious and well maintained. The facilities should be clean, professional and give the owner the confidence that the puppies are well looked after. Finding a good breeder can be stressful, follow your instincts and don’t compromise on quality. Finding the right breeder is an important ethical process wherein no shortcuts should be taken. Avoid any breeder that doesn’t have any legal Kennel Club registrations of the puppies because there’s a chance that they might be breeding puppies for profit. You want your breeder to take care of your pups as much as you plan on doing so. The Plott Hound is a rare dog in that it is one of four recognized breeds native to North America. The Plott Hound was made the state animal of North Carolina in 1989. The United Kennel Club officially recognizes seven different breeds of Coonhounds, and the Plott Hound is the only breed not connected to the Foxhound. The Plott Hound is unique as far as hounds are concerned. Plott Hounds make a distinct, high-pitched bark giving them a unique vocalization which combined with their boundless courage has historically endeared them in the eyes of hunters across the world. The Plott Hound is a large and proud canine. The Plott Hound is a large dog, it is tall and wrapped with lean muscle. Its coat is short, straight and smooth, thick and dense enough to protect them from cold weather and from debris and shrubbery while on the hunt. 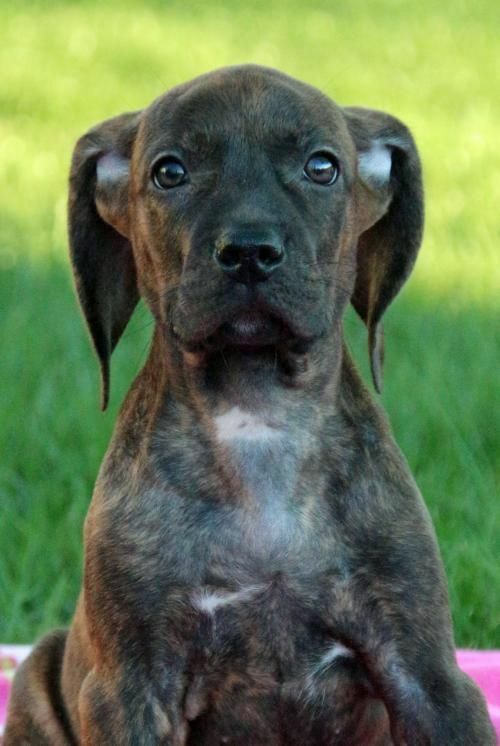 The Plott Hound has a proud and clever demeanor, its shiny eyes reflect a keen intellect typical of most hound dogs. The Plott Hound has a brown, brindle color with black tones. It generally has brown eyes, but they can also appear hazel. The Plott Hound has an upright, proper posture and carries itself with confidence. It moves purposely and is capable of remaining still and alert for extended periods of time as it observes its target. How Big is a Full-Grown Plott Hound? The Plott Hound is a rather large dog breed; males can reach between 23 and 28 inches in height while measuring between 51 and a very heavy 61 pounds in weight. While female Plott Hounds stretch between 20 and 23 inches in height and usually weigh between 40 and 55 pounds. What is the Plott Hound’s Life Expectancy? The Plott Hound is expected to live between 12 and 14 years; its lifespan is approximately average for the dog breeds of its size. The Plott Hound can live up to 16 years if it is genetically healthy, eats well, and receives regular, vigorous exercise. The Plott Hound is a courageous dog. The Plott Hound is a hunter at heart, but don’t let that betray you that he isn’t a good family pet. The Plott Hound bears the same familial love that most good hunting dogs do: it is a fiercely loyal pack member, it loves its family more than anything else in the world. The Plott Hound makes an incredible companion, for this reason, it is devoted, and its affection is not given to just anyone, every Plott Hound has its favorite humans. The Plott Hound can be excitable and playful, it is important to exercise it regularly, so it does not become bored and possibly destructive. The Plott Hound is intelligent, obedient and a decent learner, however, it is also a stubborn breed which can make training sometimes difficult. The Plott Hound loves its food, a steady flow of tasty treats makes all the difference when trying to teach a Plott Hound new commands or tricks. The Plott Hound is an eager eater, it is very active and needs to burn off a lot of energy each day. The Plott Hound will happily consume approximately two cups of high quality, protein-rich dog food each day. How Much Exercise Does the Plott Hound Need? The Plott Hound loves to play and should receive vigorous physical exercise regularly to ensure it is happy and healthy. It is recommended to walk a Plott Hound up to 45 minutes a day; it is also a good idea to ensure the Plott Hound has a spacious yard and accommodation to stretch its legs in. Don’t forget that the Plott Hound is a scent dog and will sniff out anything interesting that passes through your yard, make sure you have appropriately high fencing to keep your tenacious pup at home. The Plott Hound will likely become destructive by chewing or digging through anything in sight if it doesn’t get enough exercise. Keeping a Plott Hound physically and mentally engaged isn’t difficult, they’re an easy dog to please, and it’s important for their health and wellbeing. The Plott Hound has been blessed with strong genetics and is generally an extremely healthy dog breed. It faces very few serious or minor health issues. Gastric torsion (also known as bloat) is a serious condition which affects many large breeds of dog. It can be deadly and must be treated with serious concern. Bloat occurs when there is an abnormal buildup of air or fluid in the internal cavities and organs of the dog. Hip dysplasia affects a huge amount of dog breeds, and unfortunately, even the healthy Plott Hound is not immune. Muscular rehabilitation or surgical treatment options exist, a veterinarian must be consulted, and the appropriate treatment will be determined. The Plott Hound is an incredible breed, and it is large and proud, intelligent, courageous and an incredibly loyal partner. If you’re searching for a big, tenacious, entertaining breed to join your family, you could do much worse than the Plott Hound. It’s low price point, and general good health are other benefits of the Plott Hound, it is significantly cheaper than other more popular Coonhounds.